I love The Summit Vanuatu's body products and their business philosophy. It is not only their products that impress me but also the company's commitment to sustainable farming, their approach in educating local farmers on how to replant and manage environmentally sustainable farms and plantations, producing and growing their own ingredients for superior natural products and of course, creating amazing natural, vegan skin care that actually works! If you are interested in further information about The Summit Vanuatu's commitment to the welfare and environment of Vanuatu then more detailed information can be found in my review of their Sandalwood Water. You may have heard or read about the benefits of Tamanu Oil as a cosmetic ingredient in some skincare preparations. It seems that every time a traditional oil or herb gains favour, it is then promoted as the next best anti-aging product on the market! Well, in the case of Tamanu Oil...that may be absolutely correct! Taman Oil is a widely used traditional topical aid. Extensive research has revealed that Tamanu oil applied to wounds possesses the capacity to promote the formation of new tissue, thereby accelerating healing and the growth of healthy skin. This process of forming new tissue is known as cicatrisation,2,3 and has been the basis for most of the study of this amazing oil. If there is one thing that you want your anti-aging treatment to do...is to possess the ability to accelerate the growth of healthy skin through cicatrisation and thereby improve the general appearance of the skin. Tamanu oil demonstrates significant antimicrobial activity, as demonstrated in antibacterial and anti-fungal tests.2,5,6The oil contains several powerful bactericide/fungicide agents, which demonstrate efficacy against various human and animal pathogens. The antibacterial and Anti-fungal ability of the oil has implications for the treatment of acne and other fungal skin diseases. The Summit Vanuatu uses Tamanu Oil in many of their skin care creams, butters and foams. I love, and use, the Sandalwood, Lime and Coconut Body Foam which uses Tamanu Oil as one of the main ingredients. I use this to wash my face and hair and it is fantastic! One word of caution..as it is a foam and contains natural coconut oil and tamanu oil...this foam is better kept warm or used in the warmer months as it will not foam when solid! As previously stated, I am very impressed with The Summit Vanuatu's commitment to environmental sustainability and the local community. "In indigenous communities, nut-containing tamanu fruits are collected from the ground after they have dropped from the tree. Because the fruits are collected after they drop, no negative impact upon the life or ecology of the tamanu trees is caused by the harvest of the fruits. The trees themselves are neither touched nor harmed. Habitat is not negatively impacted, as neither the land nor any surrounding plants are disturbed as a result of collection. If not collected, the fruits and nuts simply decompose. Thus, tamanu collection is a low impact, environmentally sustainable activity. Tamanu Oil from The Summit Vanuatu is very reasonably priced and well worth purchasing. When I consider all the benefits for the skin from this oil, it is no wonder it is called "nature's miracle cure". Not only is Tamanu Oil produced in a sustainable manner, the Summit Vanuatu are committed to sustainable recycled packaging. I wholeheartedly recommend that you give this amazing oil and these wonderful products a try and receive free shipping when you order $100. 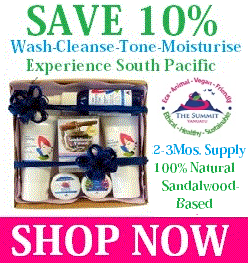 Let me assure you...that when you order products up to the value of $100 from The Summit Vanuatu...it is like a never ending box of goodies as all their products are so reasonably priced! Below is link to The Summit Vanuatu's Pure Tamanu Oil...I know that you will love it! Tamanu Oil properties in Nut Shell! 2. Petard P. Tahiti-Polynesian medicinal plants and Tahitian remedies. Noumea, New Caledonia: South Pacific Commission; 1972. 3. Pillai SN, Desai MV, Shah HM. Antihelminthic properties of punnakai cake (Calophyllum inophyllum). Indian Journal of Mycology and Plant Pathology. 1974;4(2):145-50. 4. Whistler WA. Tongan Herbal Medicine. Honolulu: University of Hawaii Press; 1992. 5. Jeanson M. Anti-leprous plants not belonging to the Flacourtiaceae family [in French]. Bulletin of National Society of Acclimation on France, 1938. 6. Chevalier J. Study on a new cicatrizing agent for cutaneous and mucous wounds, oil of Calophyllum inophyllum [doctoral thesis]. Paris, France: Institut de Biologie Normale Superieure; October 1951.
beneficial oils for your skin. Learn about Olive Oil and Pure Castile Soap. EXTRA VIRGIN OLIVE OIL SOAP. Pure Tamanu OilYour Skin will love it!